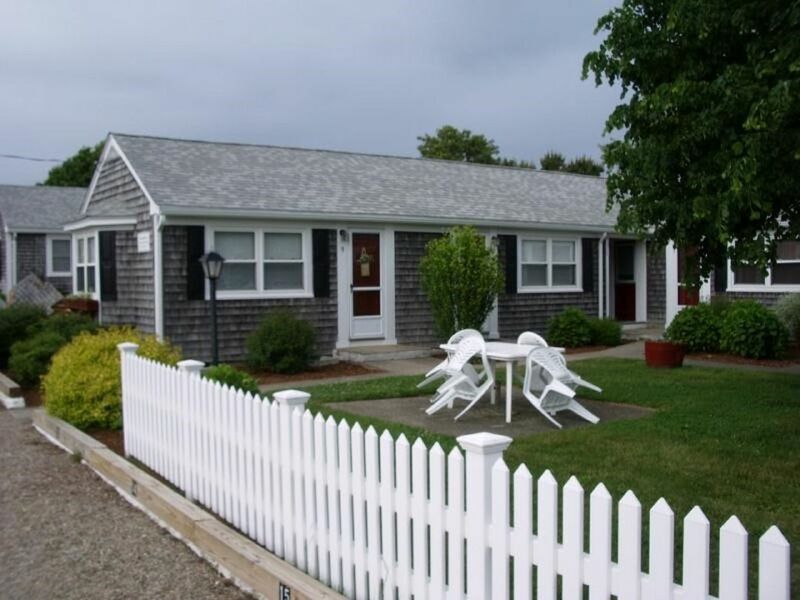 Come smell the ocean and discover Cape Cod in this beautiful sun-drenched end-unit studio with private outside patio furnished for high-end relaxing. Interior of unit includes a queen Circle Furniture sleeper sofa guaranteed to provide a good night's rest and a twin sleeper for that additional guest. Unit boasts wide pinewood flooring, a full kitchen including stainless steel appliances, gas cook top with oven, and custom white cabinetry with granite counter tops. All amenities will be awaiting your arrival including coffee pot, microwave, blender, toaster, utensils, hair dryer, wall-mounted flat screen television with cable, wireless password protected internet, central heat and air conditioning, full bath with tub and shower, and one dedicated off-street parking space. Come off the beach and take a dip in our secluded private community swimming pool or enjoy some grilling on our gas grills located right outside this unit in our beautifully landscaped courtyard with beach roses, Cape Cod hydrangeas, and picnic tables too! The Delray Beach Condominiums are Cape Cod’s finest, a beautiful community in a beautiful environment. No one under 21 years of age is allowed to rent. You must provide your own linens. One off-street parking space. No additional vehicles allowed. Check-in 3:00pm. Check out 10:00am. Thank you for taking the time to view my property at the Delray Beach Condominiums in beautiful Dennisport! I've been a proud owner since the condos originated back in 2008. I live and work in Boston. I've loved the Cape for many, many years and I know you will have a memorable and enjoyable time. Please do not hesitate to contact me with any questions about the property and surrounding area. 2 minute walk to beach and ocean. One dedicated off-street parking spot for one vehicle only. Judy’s condo is very comfortable, close to the beach, restaurants, shopping and attractions. I rented this lovely spot after Labor Day to be able to escape from the rushed days and replace them with relaxation and quiet. This spot was perfect for that. Just a minute from the ocean and some great restaurants. Hyannis was only a few minutes away. It gave me the time to relax that I wanted and needed. Beautiful location, lovely neighborhood. Nice and quiet, short walk to beach. Had fun there!!! The condo is cozy and clean!! The property is well kept and very pretty. I loved sitting on the patio in the evening. Always a beautiful breeze. Perhaps a few less pillows would afford more space in the condo. Fabulous Cape get away ! The Cape has always been magic to me ! Judy has brought that magic into her Cape cod condo retreat. The moment you walk inside her love of the cape shines through !!! She caputures the very essence of a sea side get away. Thank you Judy our stay was amazing ! Your patio is delightful!!!! Exceptionally clean and close to the beach! Thank you for a wonderful stay! Judy, your condo is the perfect destination for R&R close to the beach. Condo comes with all amentities needed for a delightful stay. Exceptionally clean and stocked with fresh towels and paper products. And, the best part is that it’s a two minute walk to a small beach — great if you have a toddler who wants to go back and nap mid day! This condo is decorated so cute and beachy! There’s everything you need to have a wonderful stay. We loved sitting outside on the private patio! The pool is literally right around the building and the beach is within very short walking distance! The owner is very responsive and easy to work with. We absolutely loved the condo and had a wonderful time! Location, location, location! You will be able to walk to restaurants, shopping, and be at the beach in just a quick two minutes. Rent bikes or bring your own to see the famous Cape Cod’s bike trails, discover the National Sea Shore, or hop a ferry to Nantucket or Martha's Vineyard!